Pigs are like huge puppies. Truthfully, they are really very similar to dogs. They housebreak themselves, and if their pen is large enough they will choose a “toilet corner” for themselves—the corner farthest from where they eat. They are very clean animals, and will only be filthy if given filthy living conditions. Our pigs will choose a clean bed of straw over a dirty mudhole any day, so we do what we can to keep their pen clean and dry year-round. They don’t have a cooling mechanism, like sweating or panting, so they need to be kept cool if the weather is hot. They definitely appreciate a mud bath or a cool shower on a sunny day. Katie is trying to get her new babies to go outside. It’s important that they get out and start digging to find minerals in the soil. Katie doing the best she can to rest while her 5-week old litter nurses. 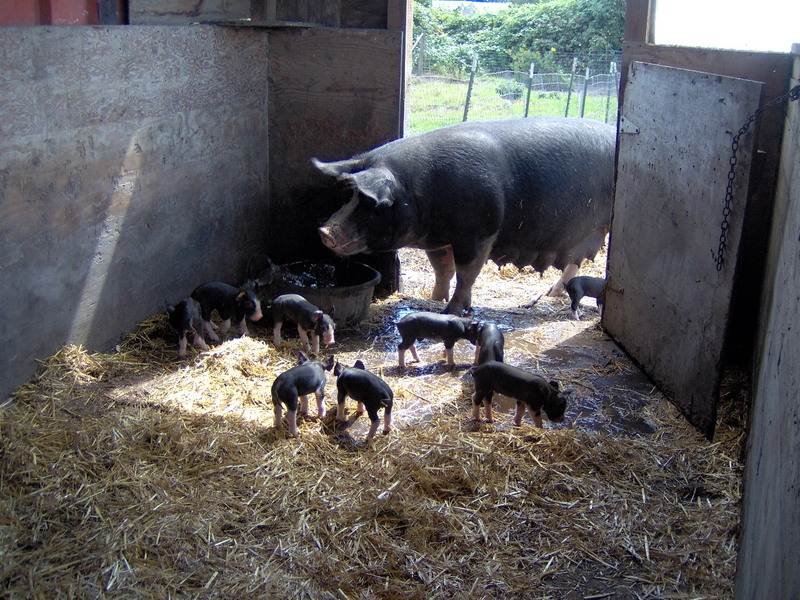 Katie was 14 years old when she had this litter—a testament to natural pig husbandry. Caged pigs aren’t in production more than a few years. Early nomadic herdsmen didn’t make much use of them because they weren’t as easy to move as cattle, sheep, and goats. 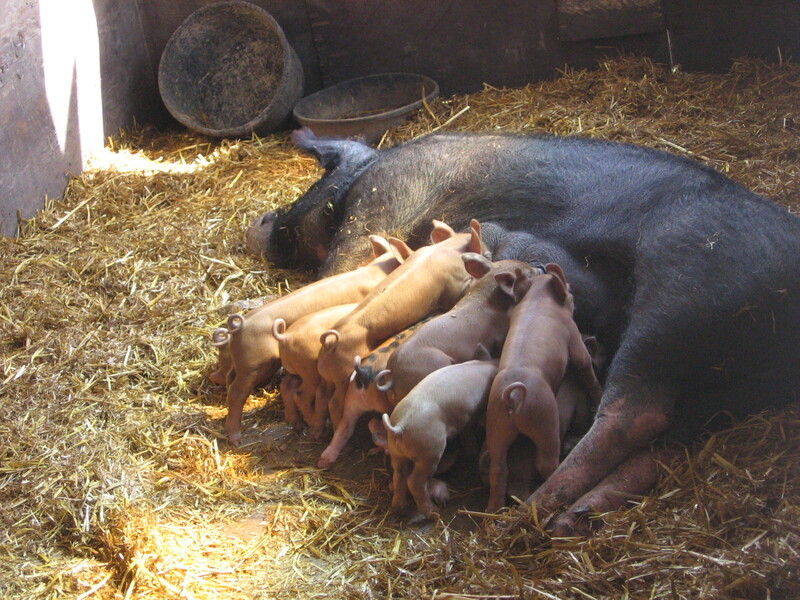 While most livestock were utilized initially by nomadic peoples, swine are mor indicative of a settled farming community. In the early 1970s, one of the goals of South Vietnam’s leaders was to produce five tons of rice and two hogs with one worker per year per hectare (2.4 acres). The hogs were important in this plan, not so much for the meat as for the fertilizer that would make the five-ton yield of rice possible. The European wild boar, Sus scrofa was domesticated in northern Europe during neolithic times, and some still roam the forests there. This was the pig renowned throughout history as the quarry in the elitist sport of boar hunting. His strength, strong tusks, great ferocity, and fighting ability made him a prize for hunters who dared to test their powers against such a beast. The East Indian pig is somewhat smaller and more refined than the European pig. Originating in the East Indies and southeastern Asia, Sus vittatus comprises a number of races including the domestic pig of China. This blood is evident in many of our modern domestic breeds. Authorities believe that all modern domestic breeds can be traced back to these two species. Pigs are not native to North America. Columbus introduced them here on his second voyage, which gives some indication of the esteem in which swine were held in Europe at that time. Hernando de Soto took 13 pigs on his exploratory journey from the Everglades to the Ozarks. Three years later the herd numbered seven hundred Presumably, those that escaped were the ancestors of the wild pigs found by early settlers in those areas. By 1790, six million pounds of pork and lard were exported from the colonies. Thus, hogs had an early impact on the agricultural exports of America. Yet, there was little or no pig farming and the animals were virtually wild, roaming the New England countryside at will, foraging what they could. The animals were hunted, usually with dogs.